I’m thinking of bringing a more glamorous fanny pack back into fashion. Well, at least for my personal use. 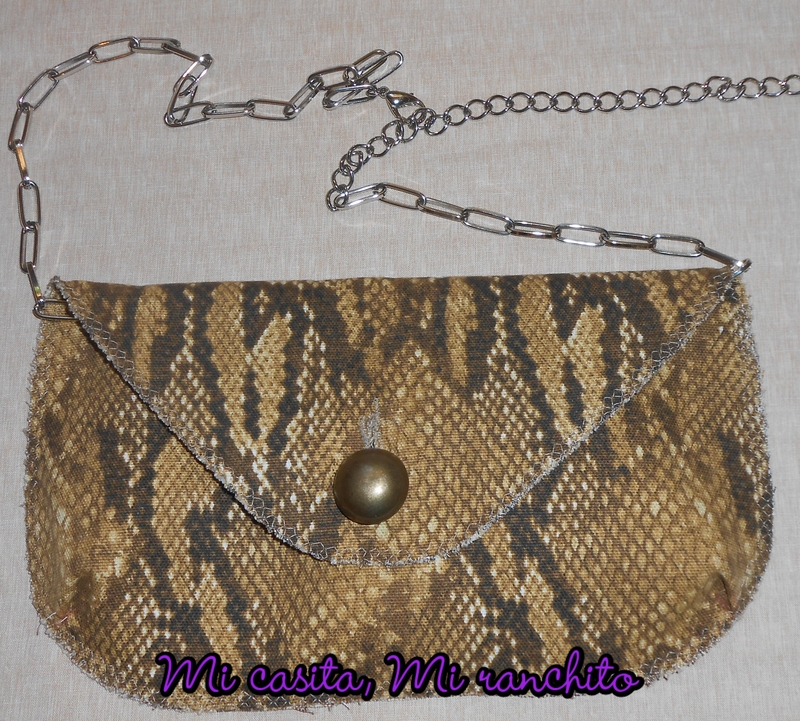 The clutch purse I made several months ago will be the one I use to make my fanny pack. Years ago when hubby and I would travel we would quickly grab our fanny packs, especially when we went to Reno or Las Vegas. I know that they’re not very fashionable and considered elderly wear, and a faux pas, but I’m here to bring it back into fashion for women. Since we’ll be taking a little trip soon, I’m trying to make things a little easier for myself because my purse weighs at least 10 lbs. with all the junk I carry in it. My idea sounds good for me and hope some of you will think the same. 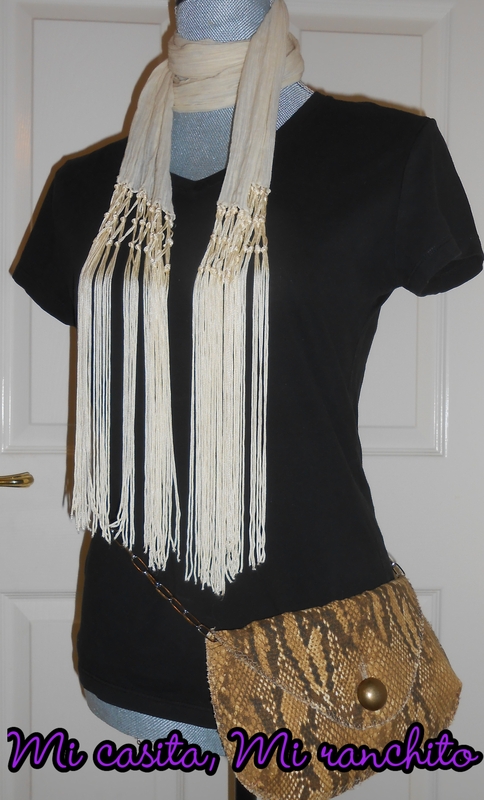 I found a metal chain belt that will be used to fasten around my waist holding the purse in place once I sew some belt loops on the inside of my clutch purse. Finding what to wear it with will be fun. I have finished some projects. First of all, my grandsons projects were so easy to do. 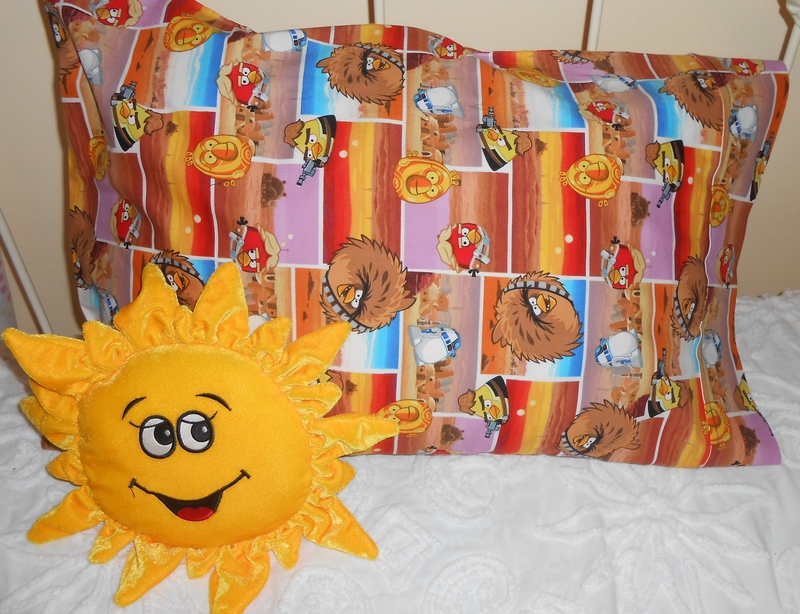 I made them some pillow cases with some of their favorite characters. 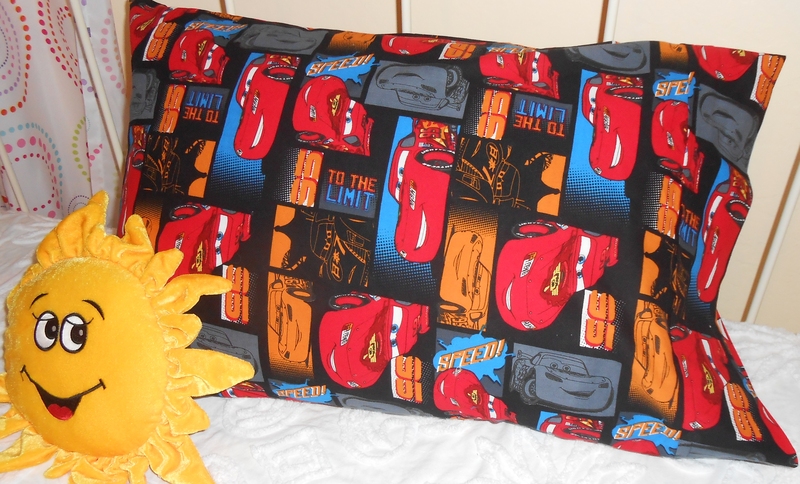 Pillow cases aren’t such a creative idea, but I figured they would enjoy laying their little heads on Angry Birds and Lightning Mcqueen. 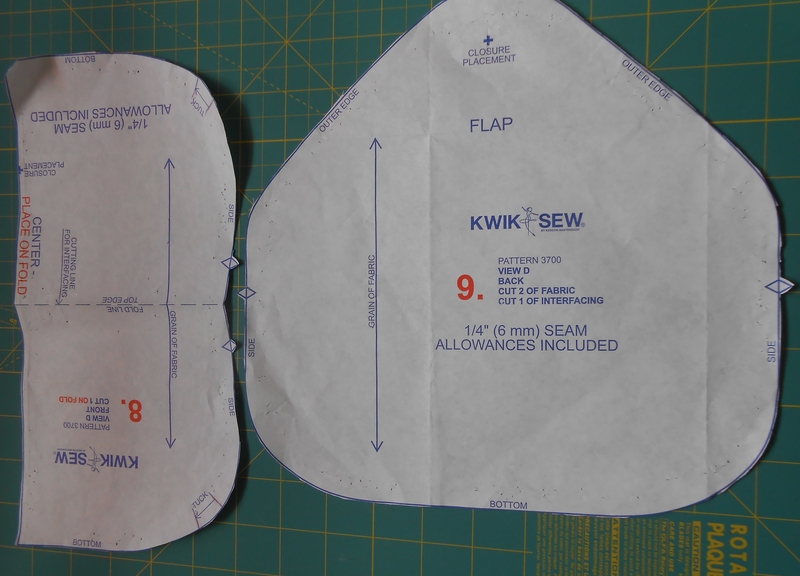 You don’t even need to use a pattern, just take one of your old pillow cases and take the measurements and add on a 5/8 seam allowance for the side seam and leave about 5 inches for the hem. I used just a touch over 1 yard of material for each one. Super fast and super easy! This is a great project for mothers doing a room makeover. It’s always fun to add your own touches. 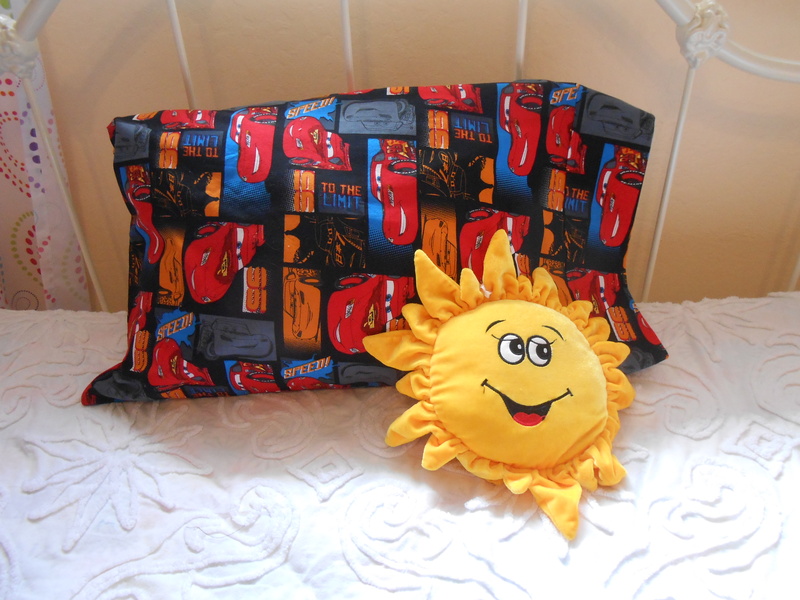 Little girls would love a girly pillow case. 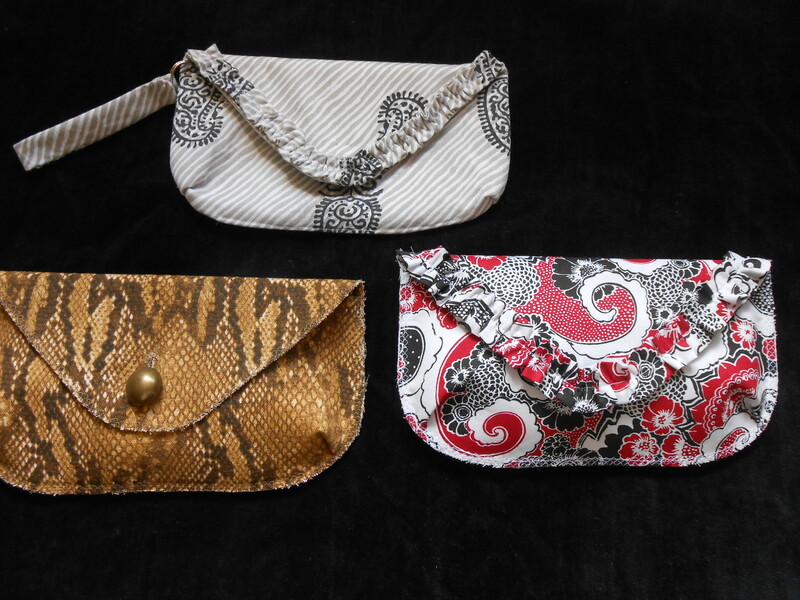 I’ve also been experimenting with clutch purses. 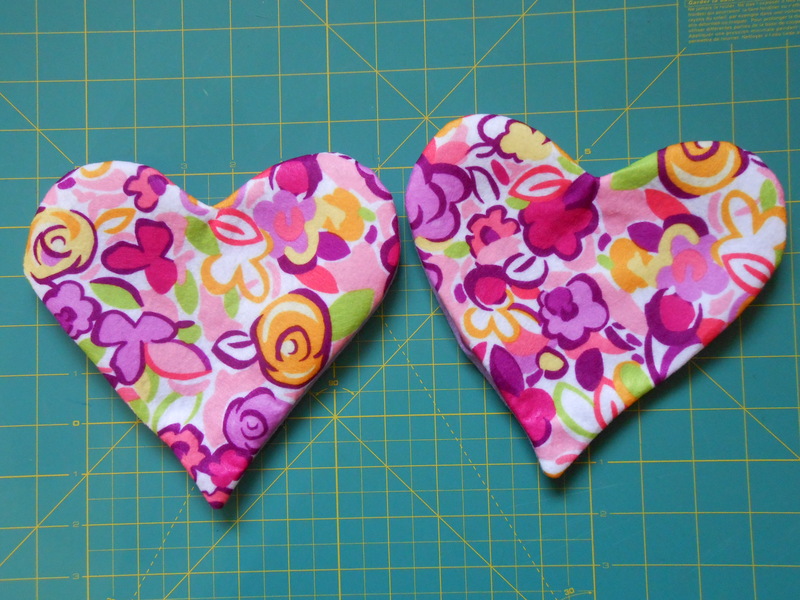 The pattern I used was a kwick sew pattern which only has 2 pieces, and it was super easy as well. 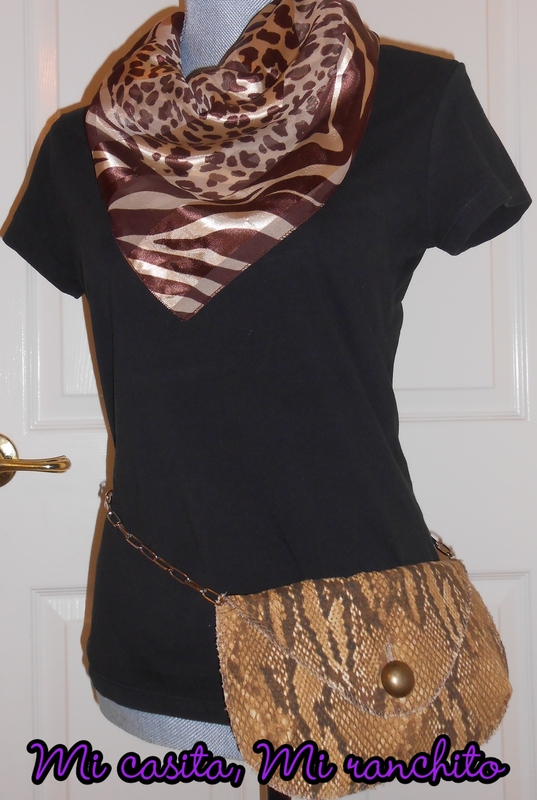 This clutch purse would be great for going out on a date and it’s easy enough to make several to go with different outfits! 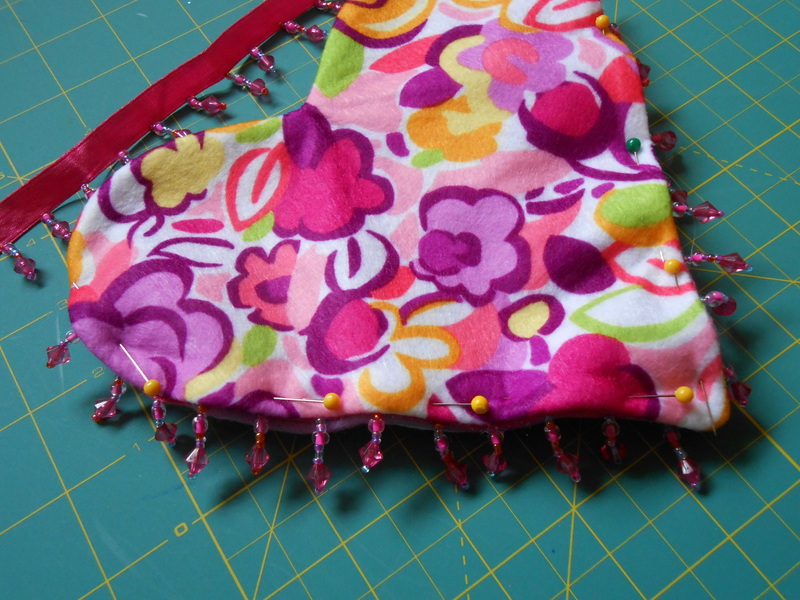 The pattern gives you a choice of a finished seam or using a zig zag stitch to finish the edges. 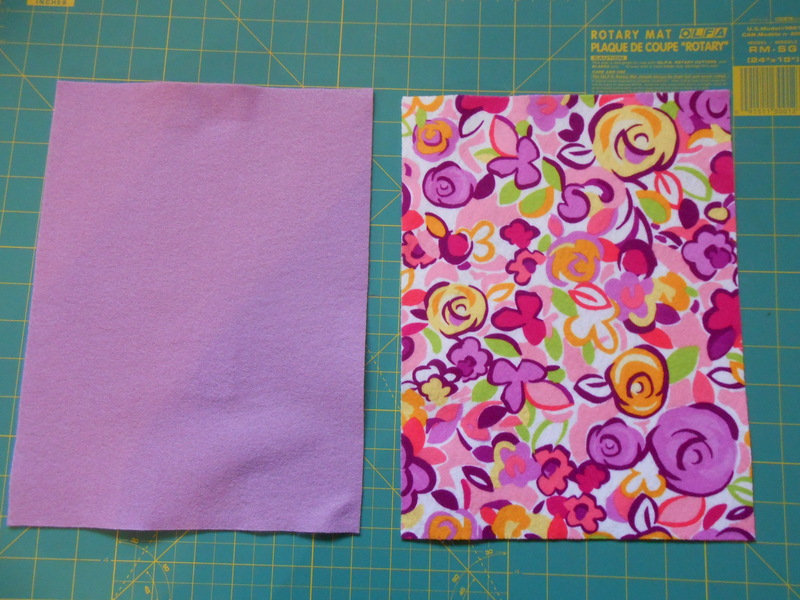 It does call for a serged edge, but I don’t have a serger, so I used a zig zag stitch. I’m still working on little handles and closures. These are just practice ones, till I can make that perfect one. In the future I hope to start an Etsy shop so I’m trying to find my little niche. 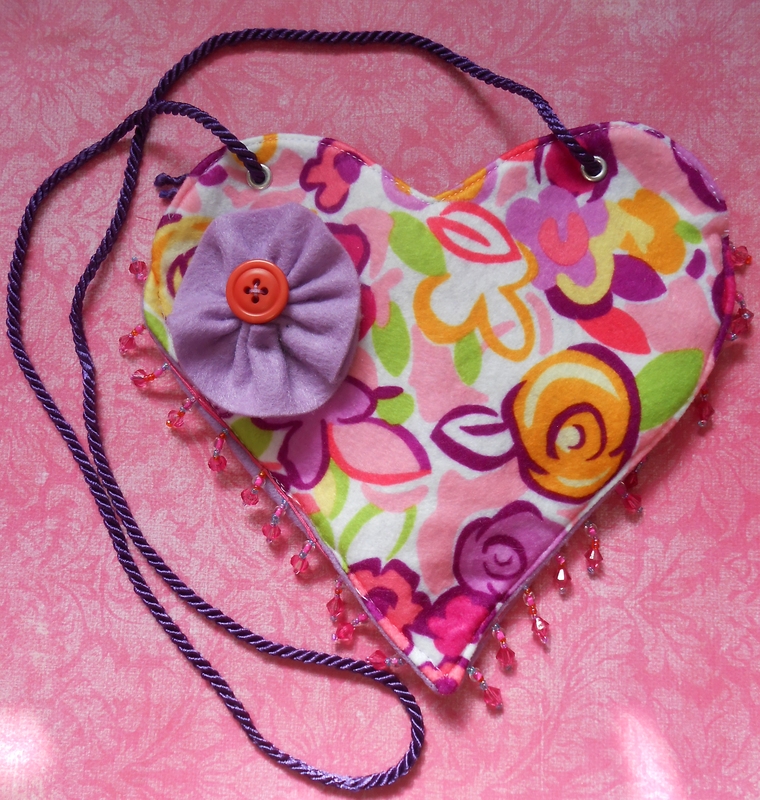 This was my first try at making a little purse and was fun to make because I’m thinking my granddaughter will enjoy it. It’s cute for Valentine’s day or any day of the week. Here are the steps to make it, in case anyone is willing to try. 1. Choose your fabric, I used felt rectangles, for both inside and outside, but would now use cotton fabric for the lining, since the felt, along with the beaded trim made it hard to sew together. 2. 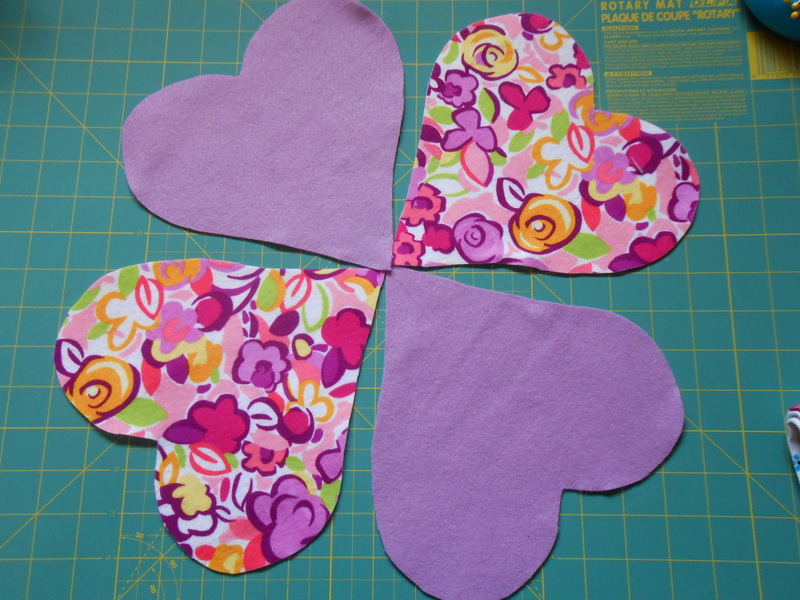 Use a heart pattern, any size that will work for you. 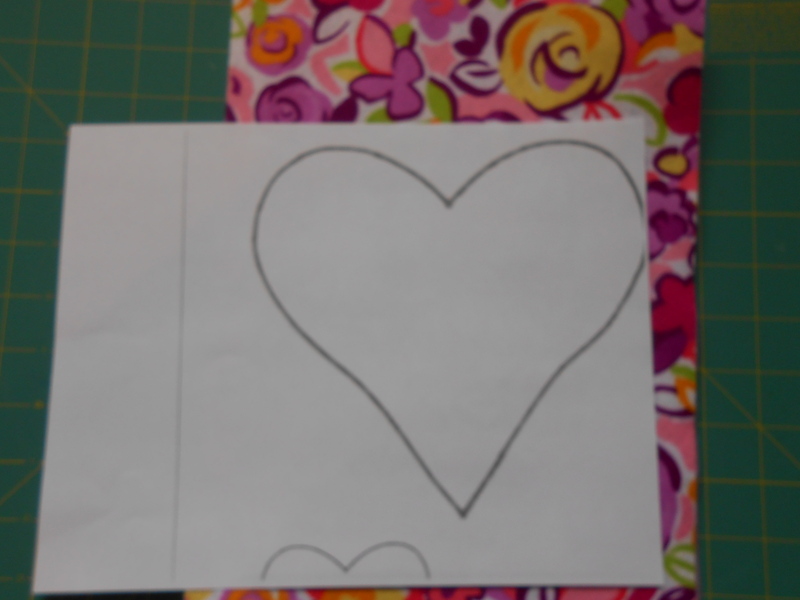 My heart was 7 1/4 inches wide and about the same for length. 3. Cut 2 pieces for the outside of the purse and 2 pieces for the lining and sew the pieces together on wrong sides leaving a little opening to turn inside out. 4. 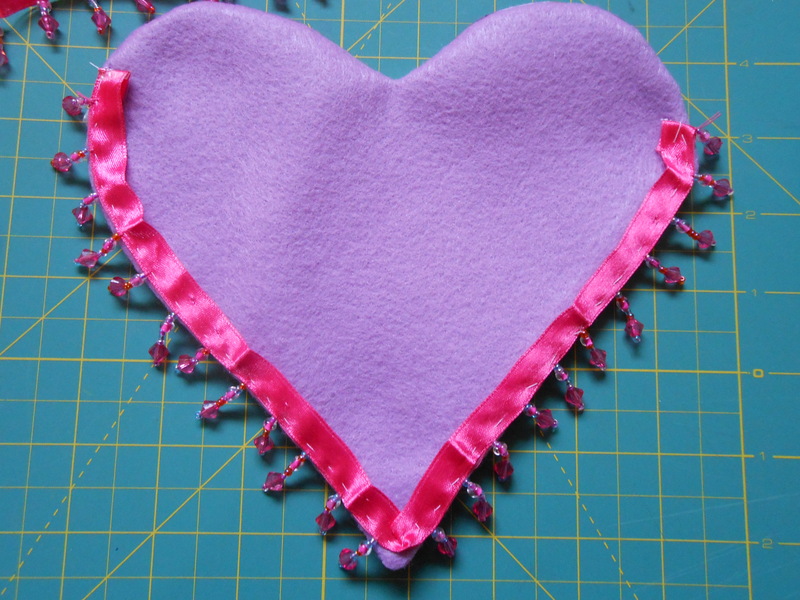 Trim is optional, but I wanted a beaded trim, so I basted it on the inside of one of the finished sides and then put both sides together and sewed on outer edge of the heart, but make sure you don’t sew the top because that will be the opening of the purse. And now you should have the body of the purse. 6. 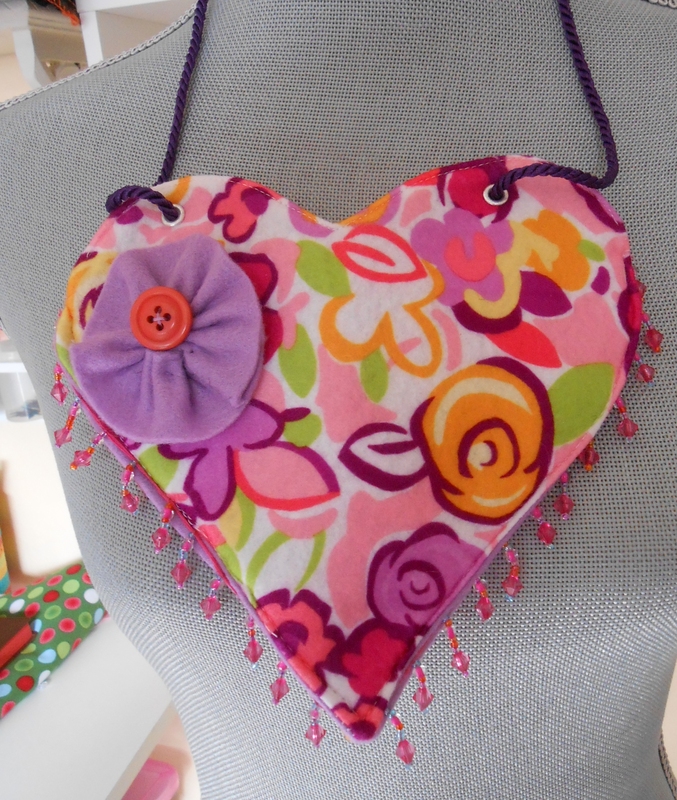 If you’d like you can embellish the purse, I used a felt flower that I made and added a button in the center of the flower.